E7000A series cable and antenna analyzer is a perfect instrument for wireless and broadcasting base station. It covers 25 MHz to 6000 MHz frequency span and fits for the wireless communication and broadcasting market. 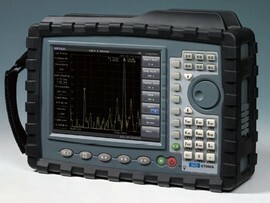 E7000A series provides 3 GHz spectrum analyzer option. The spectrum analyzer option can be configured as spectrum analyzer, interference analysis, power meter, and field strength meter. With the multi-functional capabilities, it eliminates the need to carry and learn multiple instruments. With >42 dB return loss dynamic range, E7000A series verifies the cable and antenna system which conform to performance specifications. DTF (distance-to-fault )function troubleshoots systems and locate the problem. E7000A series displays cable characteristic(VSWR and RETURN LOSS) versus distance. Using the tools, users can monitor small relative changes over time. 2-ports transmission measurement enables you to measure gain, isolation and insertion loss as well as sector-to-sector isolation verification. The power meter sensor option provides RMS measurement for both CW and digital modulated signal. It supports 50M~6GHz frequency range. E7000-SA covers 100k Hz to 3 GHz frequency range. With this option, E7000A series can provide spectrum analysis, power meter, ACPR, OBW and interference signal analysis functions. GPS receiver option provides location (longitude, latitude, altitude) and Universal Time (UT) information. For the E7000A series, all measurement results can be saved with location and time information. E7000A series is integrated with cable&antenna analyzer and spectrum analyzer. Users can perform measurement for wireless and broadcasting base station installation, maintenance with only one instrument – E7000 series. Better user interface and easy to use. With 1.5ms/point sweep time, it is better for field measurement. With more than 1GB internal memory space, E7000A series can save more 2000 trace files. E7000A series has 2 calibration modes. Standard OSL(OPEN-SHORT-LOAD) calibration is more accurate. Full span calibration is based on the stand OSL mode. With this mode, users don’t need to re-calibrate the E7000 series when change the frequency range. E7000A series has one 10M/100M LAN port. It supports standard SCPI program interface which is open to user for developing user defined program. E7000A series has 2 USB ports. It is easy to import and export files between the instrument and USB disk.